This active speaker system is based around the latest Bluetooth technology - hence the choice of name for this model. Bluetooth is just one of a number of possible options when it comes to the choice of enjoying home entertainment. The array of inputs and outputs caters for just about everything in a simple, easy to connect, easy to control way. With 2 x RCA plus a 3.5mm stereo jack input, the Blue also offers USB (for PC use only) plus optical and coaxial digital inputs. It has RCA out plus a sub out. 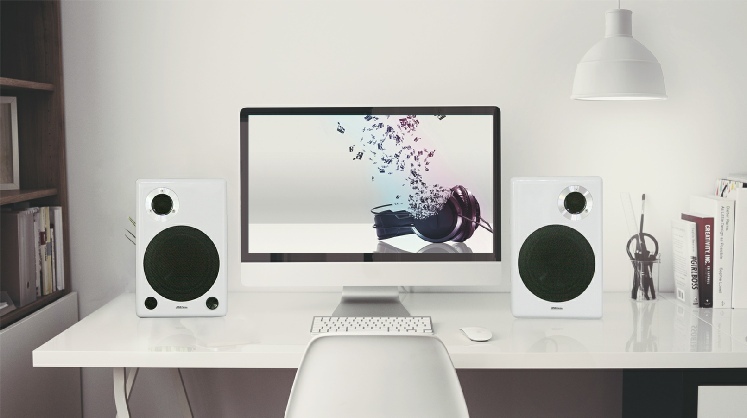 Like its predecessor, the AktiMate Maxi, it has a Class AB amplifier in the active speaker with a power output of 60 WPC into its own 4 Ohm speaker load. It has a 165 mm mid/bass speaker with an offset 25mm soft dome tweeter - the speakers being developed specifically for AktiMate. It continues to be available in a choice of familiar AktiMate high gloss options - black, red or white. The remote, which we designed specifically for the AktiMate Blue has independent controls relevant to every function. We have avoided symbols for the inputs, opting instead for easy to read text. Fitting comfortably in the palm of your hand, our aim was to make it so simple to use that it rates as one of the most user friendly around. We also made sure that if the remote ws lost or misplaced, all functions are readily accessible via the control knob on the front of the speaker. The Blue can be the heart and soul of any home entertainment system..… it boasts a true and tested hi-fi pedigree with everything neatly packaged into just one pair of active loudspeakers. And to make life even easier, everything you need to connect and be up and running in 5 minutes is right there in the box. Output current limiting. Thermal over temperature. Power on/off transient protection. Replaceable external mains fuse. IEC mains power cord. Connecting speaker wire. 3.5mm connection cable. USB Cable. RCA cable. Rubber feet. 4mm banana plugs. Remote control handset. Metal pin hook.